International Albinism Awareness Day celebrates the human rights of people with albinism everywhere. Albinism is a genetic condition which results in a lack of pigmentation in the hair, skin and eyes, causing vulnerability to sun exposure and bright light. Added to these problems is the danger for people with albinism being hunted and attacked or killed for their body parts for witchcraft activities. Tim and Rachel Monger are reps for EI in Mwanza and coordinate the work of EI in partnership with the Tanzania Assemblies of God. 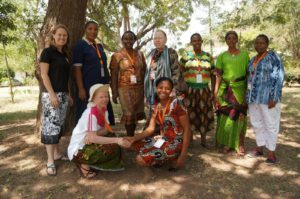 Rachel is also involved in a brilliant ministry supporting mothers affected by albinism and work with a group of women in Mwanza, Tanzania called “Upendo wa Mama” (Mother’s Love). These mamas have albinism themselves or have children with albinism. Life for many mothers who have birthed children with albinism is often one of fear and rejection. Often rejected by husbands and/or by their family or village, many struggle to provide for themselves and their children and live in fear for the lives of their children. Several have had attempted attacks on their lives or their children. They have been discriminated against because of their children, whom they love with a fiercely protective love. Upendo wa Mama seeks to support these women. The group meets together to support and encourage one another, to work on income-generating projects and to read the Bible and pray together.